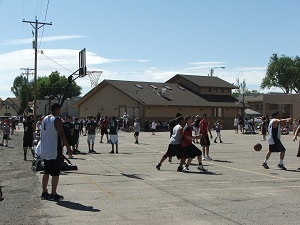 Rally in the Valley is an annual fundraiser event for the city of Monte Vista. This event is sponsored by many individuals and businesses around the San Luis Valley but the main sponsor is Alibi’s Sports Bar & Grill located on 859 Acequia Drive (one block north of Main Street and Adams Street). Rally in the Valley event is held each year on the third weekend of June. This event raises money for many different activities in the Monte Vista area. A portion of the money raised has been donated to the local Boys and Girls Club, Kids Connection, playground equipment at the local elementary school, a skate park, and a 4-H livestock utility building at Ski Hi Park including a sound system for the complex. The events include a Pool Tournament at Alibi’s Sports Bar & Grill, a 3 on 3 basketball tournament, and numerous activities for children at Fullenwider Park. There are also musical groups performing at various times throughout the weekend and a fireworks display. 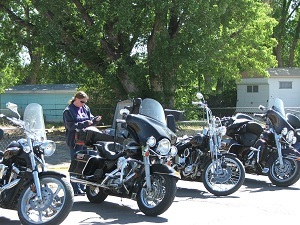 During Rally in the Valley, motorcyclists from the San Luis Valley, Colorado, and surrounding areas meet to compete in a Group Poker Run. When you sign up (costs money) you are given a card. You then drive to various predetermined locations and there you draw another card. At the end of the day the player with the best hand wins! Just like in poker. The winner of the Group Poker Run for Rally in the Valley usually gives the money back to help support the fundraiser. In 2011, the Group Poker Run made $25,000. 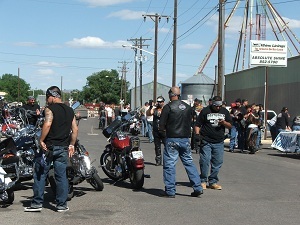 There are usually about 150 to 200 motorcycles involved in the event. It is fun to see the many different types of motorcycles which the participants ride. 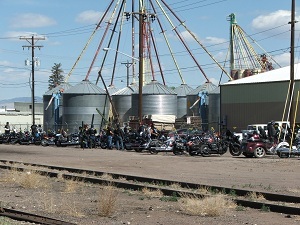 Watching the motorcycles leave town is quite a sight as they leave on the Group Poker Run. 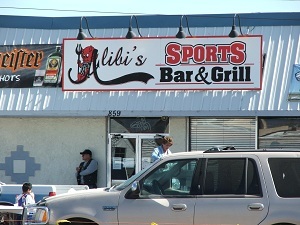 Alibi’s Sports Bar & Grill, is one of Monte Vista’s premier restaurants. The atmosphere at Alibi’s is fun and relaxed. There are many big screen televisions located throughout the restaurant so you can enjoy a meal and not miss any sports action. There is a bar area, but if you visit with the family, there is a separate dining area. Our whole family really enjoys the food served at Alibi’s. Their menu is loaded with many entrees including salads, basket meals, sandwiches, burgers, south of the border, and all American. There is even a BOCA burger for any vegetarians or vegans. They have an amazing choice of sides which include regular fries, seasoned wedges, curly fries, sour cream and chive fries, onion rings, cottage cheese, chips or a side salad. There is a wide variety of appetizers, a la carte, and desserts for your enjoyment. The price range for an entrée is very reasonable with the most expensive being $12.95. If you are a motorcycle lover or just want to check out all the cool bikes then Rally in the Valley is the place you need to be during the third weekend in June! !